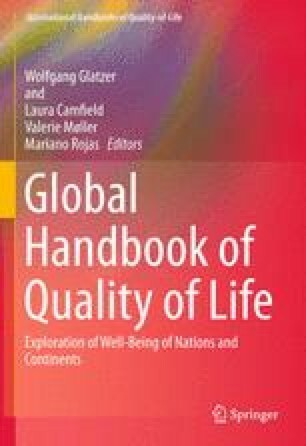 First, concepts of hope from different disciplines are presented, after which studies about hopes and fears in the field and beyond the field of Quality of Life research are reviewed. We conclude that hopes and fears are part of subjective wellbeing, but this has not yet been worked out. With hopes and fears, which design future expectations of individuals and collectivities, we consider one aspect which is part of subjective wellbeing. If the sample of respondents represents the whole population, we get social reports about the subjective state of the nation. The text provides a social report on the subjective state of a nation based on the hopes and fears of citizens from different nations. The levels of hopes and fears and their continuity may change and this will have consequences for the future perspective of nations. That is why we will have a look at theoretical and empirical results in this field. I dedicate this chapter to Prof. Wolfgang Glatzer. It was a pleasure for me working with him. Allensbacher. (2012). http://www.ifd-allensbach.de/uploads/tx_reportsndocs/prd_1209_01.pdf. Viewed 2 May 2013. European Commission. (2011). Eurobarometer 76: Autumn 2011. http://ec.europa.eu/public_opinion/archives/eb/eb76/eb76_agreport_en.pdf. Viewed 11 Jan 2013. European Commission. (2012). Future of Europe report. http://ec.europa.eu/public_opinion/archives/ebs/ebs_379_en.pdf. Accessed 11 Jan 2013. Gallup. (2013). http://www.gallup.com/poll/122453/understanding-gallup-uses-cantril-scale.aspx. Accessed 16 Apr 2013. Gallup International Association. (2011). Global barometer of prospects for peace. http://www.gallup.com.pk/eoy11/pressreleases/GlobalPeaceIndex.pdf. Accessed 9 Jan 2013. Gallup International Association. (2012). Global barometer of hope and happiness 2012. http://www.wingia.com/web/files/news/38/file/38.pdf. Accessed 8 Mar 2013. Gallup International Association Global Barometer. (1977–2012). http://www.gallup.com.pk/trend_data.php. Accessed 9 Mar 2013. Gallup World View. (2012). https://worldview.gallup.com/default.aspx.Accessed. 11 Jan 2013. Jolley, R., & Katwala, S. (2012). Hopes and fears. British future state of the nation poll. http://www.britishfuture.org/wp-content/uploads/2012/01/BritishFutureHopesFears.pdf. Accessed 12 Jan 2013. JP. Morgan Asset Management. (2011). http://www.jpmam.de/DE/dms/2011-07-01_JPMAM_Investor_Confidence_Mai_2011_%5BPRE%5D_%5BDE_DE%5D.pdf. Viewed 9 Sept 2012. Livingston Survey. (2013). http://www.philadelphiafed.org/research-and-data/real-time-center/livingston-survey/2013/livjun13.pdf. Viewed 25 June 2013. Moller, V. (2012). South African quality of life trends over three decades, 1980–2010. Social Indicators Research. http://link.springer.com/article/10.1007%2Fs11205-012-0120-y. Accessed 1 June 2013. OECD. (2011). http://www.oecd-ilibrary.org/sites/soc_glance-2011-en/07/03/g7_he3-01.html?contentType=&itemId=/content/chapter/soc_glance-2011-23en&containerItemId=/content/serial/19991290&accessItemIds=/content/book/soc_glance-2011-en&mimeType=text/html. Accessed 4 May 2013. Reinhardt, U., & Roos, G. T. (2008). Future expectations for Europe. http://www.stiftungfuerzukunftsfragen.de/fileadmin/user_upload/publikationen/2008/Future-Expectations-For-Europe.pdf. Accessed 12 Jan 2013.